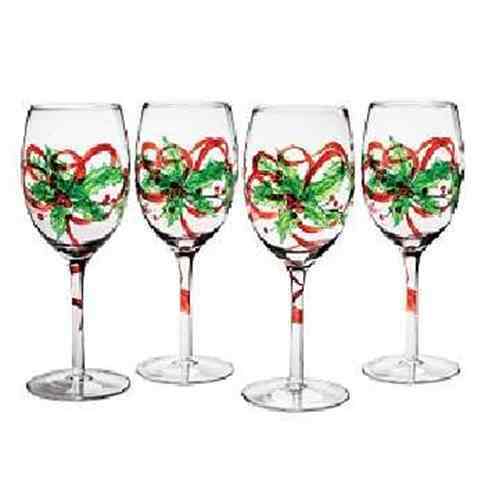 Christmas painted wine glasses in green bow design are beautiful and fun in red and green colors. 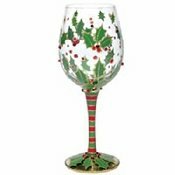 These hand painted Christmas wine glasses are whimsically painted like pretty Christmas gifts waiting to be opened Christmas morning. These make lovely gifts to give or to especially keep as your own. The bows are large swirls and etched in gold with a touch of glitter to give that glamorous feel. 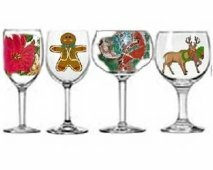 We offer alot of different style ans shapes so be to choose the glass you want in the Glasses drop down option. 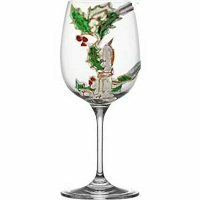 If you don't see a particular glass that you want be sure to email me at support@clearlysusan.com and I will gladly try to find it for you. These are beautifully done. Love the way you paint the swirls plus with the glitter gives it an added sparkle. 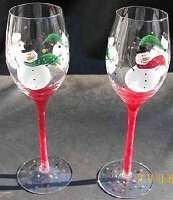 These will be a hit at my Christmas party. Thanks.